Prithvi Narayan Shah was born on Poush 27th, 1779 in Gorkha. He was the son of King Narabhupal Shah and Queen Kaushalyawati. He had two queens, Indrawati and Narendralaxmi. Prithvi Narayan Shah ascended the throne in 1799 BS after his father's death. As soon as he ascended the throne, the same year he tried to conquer Nuwakot. He sent troops under the command of Kazi Biraj Thapa but lost. As Kalu Pandey, Prithvi Narayan Shah's Kazi suggested, he recruited soldiers from Terai, made his army and trained them in warfare. He was far-sighted and clever. So, he made friendly relations with the neighboring kingdoms so that they would not attack Gorkha in his absence. In 1801, Prithvi Narayan Shah attacked Nuwakot from 3 sides and conquered it. He also invaded Belkot, but he had to pay a high price of losing many soldiers. Jayaprakash Malla tried to chase the troops from Nuwakot, but he failed. Prithvi Narayan Shah wanted to conquer the Kathmandu valley. So, he occupied Naldum and Mahadevpokhari but Jayaprakash Malla regained Naldum. Then, Prithvi Narayan Shah conquered Lamindada and Dolakha. During his unification process, Lamjung and Tanahun together attacked Gorkha but both were defeated. King Trivikram Sen of Tanahun was arrested. Prithvi Narayan Shah captured Pharping, Bodegaun and Khokana. He tried to conquer Kirtipur but he was badly defeated and Kazi Kalu Pandey lost his life in the battle. Though he was not discouraged and he conquered Shivapuri, Palanchok, Kabhrebot and Kabilaspur in the meantime. Due to the expansion of Gorkha kingdom in a rapid pace, King Digbandhan Sen of Makwanpur became afraid and he joined Jaya Prakash Malla. Prithvi Narayan Shah sent troops to Makwanpur. The king of Makwanpur, along with his minister, fled away. Makwanpur was also captured in 1819 BS. In 1819, Mir Kasim, nawab of Bengal attacked Gorkha. The Gorkha troops defeated them and captured their arms and ammunitions. In Bhadra 1823, he tried to invade Kirtipur. He lost this time as well making a narrow escape. His commander, Surpratap Shah lost his left eye and Daljit Shah was wounded. After some months, he again attacked Kirtipur and, this time, he was successful. When Gorkhas surrounded Kathmandu valley, Jayprakash Malla feared of losing his kingdom. He asked East India Company to send troops. 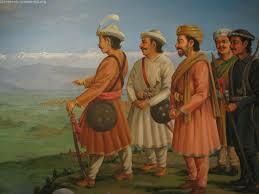 In 1824, Gorkha soldiers defeated the enemy. In 1825, during the festival of Indrajatra, Gorkha made an attack from 3 sides. Jayprakash Malla fled to Patan. After 11 days of conquering Kathmandu, Patan was also captured. The king of Patan, Tej Narsingh and Jayprakash Malla fled to Bhaktapur. In 1826, Bhaktapur was also conquered. King Ranjit Malla surrendered. In this way, Prithvi Narayan Shah conquered the whole valley. After the successful conquest of Kathmandu valley, he conquered Kaski, Dhor, Paiyun, Rising and Bhirkot. Then he captured the eastern regions like Morang, Chaudandi and Kirant region. In 1831, he occupied Vijaypur. Prithvi Narayan Shah wanted more extension. His conquest of Sikkim failed as he died on Magh 1, 1831. By this time, he had extended his territory up to the Mechi river in the east, Gandaki in the west, Tibet to the north and Bihar of India to the south. Prithvi Narayan Shah contributed a lot to unite the scattered kingdoms into a greater Nepal. Prithvi Narayan Shah was born on Poush 27, 1779 in Gorkha. Prithvi Narayan Shah ascended the throne in 1799 BS after death of his father Narabhupal Shah. In 1801, Prithvi Narayan Shah attacked Nuwakot from 3 sides and conquered it. After the successful conquest of Kathmandu valley, he conquered Kaski, Dhor, Paiyun, Rising and Bhirkot. Prithvi Narayan Shah had extended his territory up to the Mechi river in the east, Gandaki in the west, Tibet to the north and Bihar of India to the south and died on Magh 1, 1831. What benefits did Gorkha get from the victory over Nuwakot? The trade relation with Tibet was now taken as advantage to Gorkha and received gold coins. It became a good place to know about the happenings of Jaya Prakash Malla. From the fertile land of Nuwakot, a good deal of production of food grains was benefitted. What preparations did Prithvi Narayan Shah make to conquer Nuwakot? He bought and brought some weapons from Benaras with the collection of fund of Gorkhalese. He brought in the trainers to train the armies, experts to make explosive. He established a friendly relationship with Lamjung and Bhaktapur so that he wouldn’t be obstructed from them during the warship. Describe the important events Prithvi Narayan Shah faced with during the attacks over Kirtipur. Prithivi Narayan Shah was determined with a resolution to capture the Kathmandu Valley for which he captured Nuwakot at first. Then, he gave emphasis to attack the surrounding place. He then attacked Kirtipur in 1814 B.S. despite the disagreement of Kalu Pandey. The united force of the Kathmandu Valley gave a great threat of failure and Kalu Pandey met death. After that, Prithivi Narayan Shah was engaged in capturing Makwanpur and other tiny kingdoms. Then, in 1821 B.S. under the leadership of Sur Pratap Shah, the second attack over Kirtipur became unsuccessful when the arrow shot from inside struck his eyes and he fell down. The third attack over Kirtipur in 1822 B.S. was a tricky one in which the Kirtipur's people couldn't manage to do anything except surrendering when the door was opened by the Keeper and unexpected and immediate entrance was seen of the Gorkhali armies. This victory of Prithivi Narayan Shah is regarded as a very important one. How did Prithvi Narayan Shah make his victory campaign in the Kathmandu valley? Prithivi Narayan Shah was going more confident with his continuous success against any strong enemies. After capturing Makwanpur and Kirtipur, he was awaiting the moment of attack over Kathmandu Valley. Right then, the moment when King Jaya Prakash Malla was sitting in a chariot and moving around in a festive way he was startled with the immediate attack from three sides- Tudikhel, Nardevi, and Thapathali. So, Jaya Prakash Malla couldn't resist this attack and escaped to Patan. 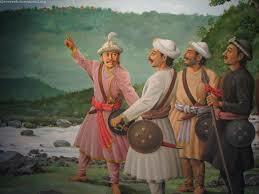 Prithivi Narayan Shah's troops came to attack and a simple battle took place. But Jaya Prakash Malla was injured, no more battle could go ahead and the three kings of the valley faced failure. In this way, Prithivi Narayan Shah became successful in his mission of being the king. Why is Prithvi Narayan Shah called the builder of the Nation? Before Nepal was unified into a single country, it was divided into several tiny states. Several attempts were made by other kings of previous dynasties, but it didn't come to success. Being tempted by the attraction of the valley, Prithivi Narayan Shah desired to be the king of Kathmandu Valley. Then, he started making plans, policies, and several preparations. To the determination, courage, excitement of Prithivi Narayan Shah, the support of his brothers born from other mothers was very important and active. The great warriors like Kalu Pandey, Ram Krishna Kunwar, Kehar Singh Basnet, Amar Singh Thapa and others also gave their sincere and valuable contribution. The western campaign was a failure despite his strong attempt. Which later came to success by spent a great toil, blood and sacrifice to his luxuries for giving a concrete success to his unification. Building a nation is not simple as building a house. Lots of efforts are required. Internal and external attacks were successful dealer over by him. As a result, we are greatly debted to him. What mythological belief do we have regarding Prithvi Narayan Shah and Gorakhnath? The mythology story related between Prithvi Narayan Shah and Gorakhnath is an integral part of the study of Prithivi Narayan Shah's biography. It is said that the coincidence of the encounter between them is a very important part which was the open secret of Prithivi Narayan Shah's success. The way that was swallowed in yogurt by Gorakhnath was denied to eat by Prithivi Narayan Shah fell into his deed. The words were given that the victory is possible where ever he steps at; this certainly came to be true in the history of unification. The deity of Gorakhnath Baba and his bless makes us believe this story. What was Prithvi Narayan Shah’s purpose of visiting Benaras? Prithivi Narayan Shah had married his second queen, belonging to Benaras. He found moral support for visiting this place. On the other hand, he was shocked with the defeat over Nuwakot. He wanted to make necessary preparations. For that he collected some support and donations from the people of Gorkha and his father-in- law. He thought of buying some weapons from Benaras. He also changed his gotra from 'Bhardhwaj' into 'Kashyap', so that there would be no blame of gotra-hatya sin. He had another purpose that he would even collect information about the East India Company where British ruled. What was the result of the foreigners attack over the force of Prithvi Narayan Shah? After the defeat over Kirtipur by Prithivi Narayan Shah, the horrified king Jaya Prakash Malla didn't hesitate to ask for military aid with the powerful East India Company force of the British in India. Accordingly, about 2500 soldiers on the representation of capital kinclock came through Janakpur-Sindhuli; the British were attacked cleverly by the Gorkhalese, who were commanded by Birkaji Thapa and Kaji Bansal Raj Pandey. They lost their lives and few of them saved their lives and escaped narrowly. The next attack was made by the Muslims of the king of Bengal. He was provoked by the enemy turned relative to Prithivi Narayan Shah called Dig Bandhan Sen. He also agreed to attack over newly won Makwanpur by the Gorkhalese by sending about 2000 armies under Gurgin Khan with well-equipped force faced nothing more than bitter defeat by the Gorkhalese. How did the economic blockade policy of Prithvi Narayan Shah play positive role to invade and capture the Kathmandu Valley? After the victory over Nuwakot and the failure the first attack over Kirtiupur, Prithvi Narayan Shah had slowly started capturing over the eastern, western, southern places like Sankhu, Changu, Naldum, Mahadev Pokhari, Belkot, Shivapokhari, Dahachowk, etc. He learned the policy and practice of economic blockade. After the victory of Makawanpur in 1819 BS, the economic blockade policy became a stronger weapon. It was called the gateway to the valley. Before he captured Kirtipur in 1822 BS, his economic blockade policy worked in a great deal to weaken the condition of the place in the valley and the people helplessly started appealing for the desire to fall under Prithvi Narayan Shah’s possession because they were not allowed to be supplied with salt and other necessary materials . This really weakened the position of Valley Kingdoms and became a Supportive strategy to win the valley kingdoms. When was Prithvi Narayan Shah born? When did Prithivi Narayan Shah conquered Nuwakot? When did Prithvi Narayan Shah die? Which of the following states was not captured by Prithvi Narayan Shah? Who was the father of Prithvi Narayan Shah? Who is Prithvi Narayan Shah is compared to? When did Kalu Pandey die? When did Prithvi Narayan Shah ascend the throne of Kathmandu? Why PN shah regard courrupts and corruptees as enemy? Any Questions on 'Unification Campaign by Prithvi Narayan Shah '?